Aloha! My name is Kirsten Carlson and I am the Artist-at-Sea aboard R/V Falkor’s Sea to Space Particle Investigation cruise. During this voyage, I will interpret nature using science and translate it into art. The technology being used will allow me to draw live plankton collected by the scientists, compare the tools used by artists and scientists to observe the sea & sky, and share my artist-at-sea experience through a virtual field journal using my sketchbook, camera, and keyboard. 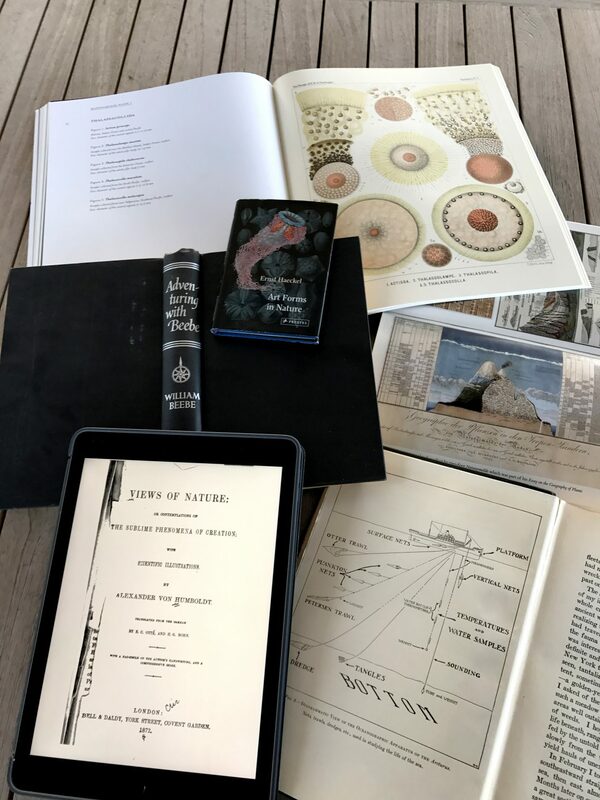 My inspiration for this approach comes from scientists in the 19 th and early 20th Century that used poetry, art, and emotional description to interpret scientific observations and discoveries. Alexander von Humboldt was a scientist that used emotional descriptions and observations full of visual details that described nature as a complex global system. Ernst Haeckel used illustration and design to introduce the public to the beauty and wonder of sea life. William Beebe descended into the depths of the sea in a bathysphere and described a world never seen before by humanity. I will do as they did, utilizing my 21st Century skills as scientific illustrator, designer and photographer, to explore and share the connections between nature, science, and art. The opportunity to be the Artist-at-Sea aboard the Falkor for a month meant I had to plan ahead on what my creative field kit would contain. It includes both traditional and modern tools—including a sketchbook, watercolors, digital tablet and stylus (I was grateful that everything fit inside a carry-on suitcase). For me, one of the most exciting aspects of being in the field is working alongside scientists as they use cutting-edge tools in their research. 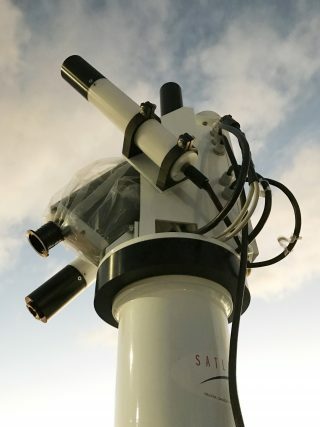 For example, we will be looking at plankton using holographic microscopy. Even before we left port, I was experimenting with technology that uses virtual reality (VR) goggles and glimpsed the spectacular implications of seeing plankton communities in three-dimensional space. I will also explore the contrast between research tools from the 1800’s and present day, including testing out a reproduction of a cyanometer: a tool once used by scientists to measure particles in space. Finally, my virtual field journal artsyfishy.com will showcase observations I make with camera, paintbrush, and keyboard in as close to real-time as possible, documenting the observations and connections I make between science, nature, and art even after the cruise is complete. 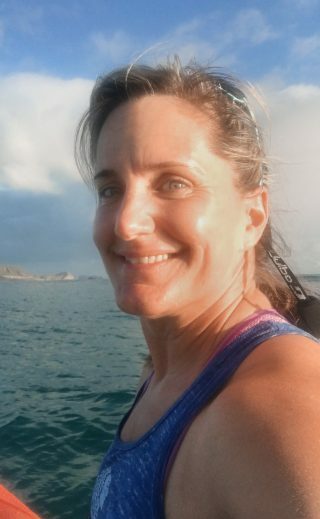 I hope that my passion for understanding nature through the lens of both science and art will give our audience the chance to connect with ocean science and new technology in new and imaginative ways. Art is an important tool that helps us see how interconnected the health of humanity is to the oceans and life on this planet. Kirsten's art kit includes both traditional and modern tools—including a sketchbook, watercolors, digital tablet and stylus. Her reference books include Art Forms from the Abyss by Ernst Haeckel (top), The Arcturus Adventure by William Beebe (bottom right) and Views of Nature by Alexander von Humboldt (bottom left). 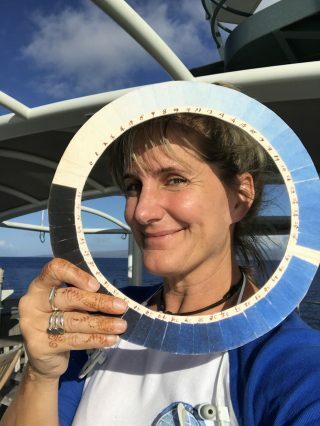 The radiometer installed in Falkor's bow will take detailed measurements of the water's color and will also be one of the instruments that will inspire Kirsten in her work.